Welcome to the ACR Multi-Strategy Quality Return (MQR) Fund (the “Fund”). The Fund’s inception was on December 31, 2014. The Fund’s advisor is Alpine Investment Management LLC, dba ACR Alpine Capital Research (“ACR Alpine Capital Research”, “ACR” or the “Advisor”). Investors should consider the investment objectives, risks, charges and expenses carefully before investing. For a prospectus with this and other information about the Fund, please contact us at (855) 955-9552 and/or click here. Read the prospectus carefully before investing. Investments in the Fund involve substantial risk. The Fund is not suitable for investors who cannot bear the risk of loss of all or part of their investment. The MQR Fund is distributed by IMST Distributors, LLC. 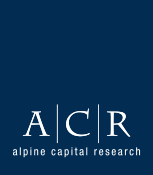 ACR Alpine Capital Research is a member of Alpine Investment Management, LLC Group, a registered investment advisor. Copyright © 2015 ALPINE INVESTMENT MANAGEMENT, LLC. All Rights Reserved.